Bad news, but not unexpected, at Perfume Shrine: the house of Serge Lutens will be discontinuing four of its scents. The decedents are Douce Amere, my beloved Miel de Bois, my even more beloved Chypre Rouge, and Clair de Musc, which I have never even tried. I bought a bottle of Chypre Rouge just last November, and then in December tried to buy a bottle of Un Bois Vanille but somehow ended up with Miel de Bois instead. (The vendor was out of UBV, and I had to have something.) I had planned to finally order that UBV today, but with this news, I'm thinking I ought to hold off and get Douce Amere instead, because it's not going to be around forever. I mean, nothing is. But now there's a timer, and it's ticking fast. 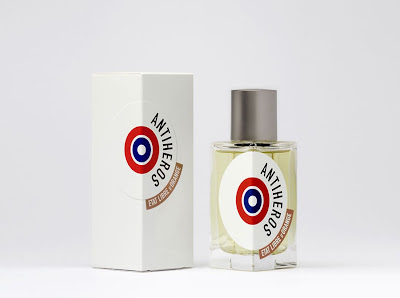 When I first put on Antihéros--the name means just what you think it does, only it's singular, French "héros" being identical to English "hero"--I thought, "Well, this can't be all there is to it, can there?" There is a bare suggestion of something tarry at the very top, a breath of Eau de Fier, and then it's just soapy lavender. Very nice lavender, and very soapy, but that's all it is. It lasts much longer than you might think, and the bottom of it, though still lavender, is a little more expansive, with a hint of wood. It is really very nice: I enjoyed using up my sample of it. It isn't fearsomely expensive: currently $69 for a 50-mL bottle. I only question why ELdO, and you, would even bother when there are lavenders that are far more interesting (though you may pay for the privilege), or just as good for much less money. There are certainly no less than a hundred scents currently on the market that contain a distinct lavender note: most fougere scents do, and there are plenty of fragrances that are hardly anything but. Demeter has a stripped-down lavender that's about a quarter the price, though it isn't as long-lasting; if you want a soapy barbershop lavender you can still find YSL Rive Gauche pour Homme; if you want a complex lavender you can buy Gaultier Le Male most anywhere; if you want something that you can't just get in the department store, you can buy Island Lavender by Caldey, hand-made by Cistercian monks. 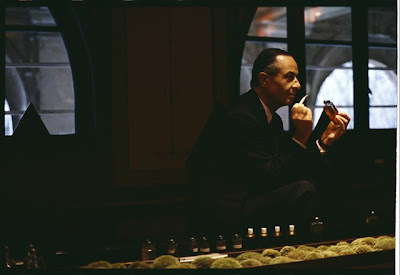 I don't want to stop anyone from buying Antihéros, and I have nothing against ELdO; I like a lot of their scents. This one, though; this one I just don't get. "To be a dramatic soprano requires not so much the attributes of a singer as those of a successful auctioneer or hog-caller. I mean, to blast your way through a Wagnerian orchestra, for instance, a beautiful tone is an absolute waste of time. You're much better off with the factory-whistle or buzz-saw type of voice, with a good cutting edge. I'm going to make an entrance for this number, because it's a good idea to use shock tactics. What I mean by that is, it's very effective to come in and stun your audience right away, with a very loud bellow. You know, it has been established in science that a sufficiently loud noise can actually kill a bowl of goldfish--did you know that?" She may as well have been describing the perfume. 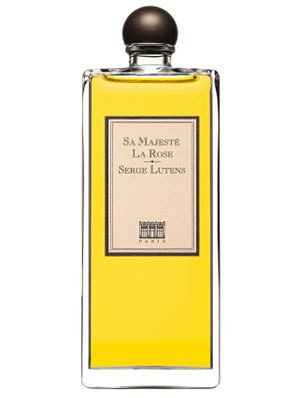 Sa Majesté La Rose is undeniably beautiful, as a rose scent can hardly help being, but it's enormous. It uses shock tactics; a colossal, larger-than-life rose, decorated with greenery (and a hint of spice), and nothing more. It takes up an ungodly amount of space: it's room-filling. Apartment-filling. It is pitched very high. It could probably kill a bowl of goldfish. At first. And then something wonderful happens; the rose slowly, slowly modulates, becoming softer and quieter, and equally slowly, a pearly warmth begins to rise up around it. There is a bit of honey to it (a frequent guest in a Lutens scent), and a creamy woodiness that lasts for hours without actually eclipsing the rose until the very, very end. It is enchanting. There is no point even looking at Sa Majesté La Rose if you like a nice, demure rose scent; this one makes a statement, and the statement is, "You will pay attention to me." 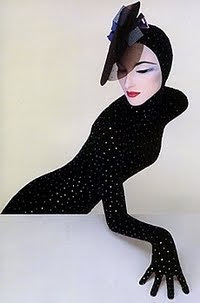 Since I am mired in a terrible Serge Lutens phase--it's all I want to wear these days--I was tremendously interested in this interview with him on Osmoz, and naturally I figured you would be, too. Well, the thing is, I can get clean scents anywhere. They're all over the place. You can't avoid them. If I wanted to smell as if I'd just stepped out of the bath, I'd step out of the bath. If I wanted to smell like a freshly-donned iron shirt, I'd put on a freshly ironed shirt. I want to smell interesting. I want to smell like something I couldn't ordinarily come up with on my own. That's the job of the perfumer. I'll still try it, of course. But I can't say I'm not disappointed in the idea. After all these things years of making mesmerizingly strange and fascinating scents, has he finally jumped on the worst, most boring bandwagon in the entire history of perfumery? I don't even want to think about it. Tomorrow: I review an older Lutens. One I love, as it turns out. Oh, the plans I had for 2010! I was going to focus on a particular perfumer or line or note every month and really investigate that, at least two posts a week and probably three, and it's already fallen into disarray. I don't know why I even bother to plan anything. I was going to do nothing but Serge Lutens in January, since I have a whole pile of samples (eight or so, with more on the way some time this month), and I have sort of become obsessed with Lutens in the last few months, but that's already ruined (since I started the month with a Comme des Garçons). Anyway, January might not be all Lutens all the time, but today is. Santal Blanc was launched in 2001, which tells you right off the bat that it's been reformulated, because it's nearly impossible to get real Mysore sandalwood any more: we basically fished it to the brink of extinction, as we have a way of doing with anything that's wonderful or useful (goodbye, Newfoundland cod fishery). Nevertheless, olfactory chemists are always coming up with clever new workarounds, and while the synthetic sandalwoods might not be exactly the same as the real thing, they'll have to do. There is, bien sûr, a hint of the usual Lutens stewed-fruit-and-spice in the very top, just to let you know that you are smelling a Lutens scent, but it's restrained; mostly what you get is a glossy, furniture-polished wooden box. It is outstandingly lovely--instantly familiar, yet abstracted onto a higher plane: some have compared it to the smell of a pencil, and that's not far from the mark, but of course it would be an idealized, perfected pencil. The overwhelming woodiness of Santal Blanc reminds me a bit of Jacques Fath Pour L'Homme (something else which has certainly been reformulated*), another colossal wooden object. They go off in very different directions, though; just because two compositions are in the key of C Major doesn't mean they have to sound anything alike. Santal Blanc has a faint bitterness which keeps it from becoming one-note and cloying, and also a subtle, pervasive sweetness in the end stages. It's not the most complex treatment of the theme you can imagine (Lutens scents rarely are), but it's interesting: it makes you think at the same time that it's making you wordlessly happy, and that really is the cornerstone of the line. 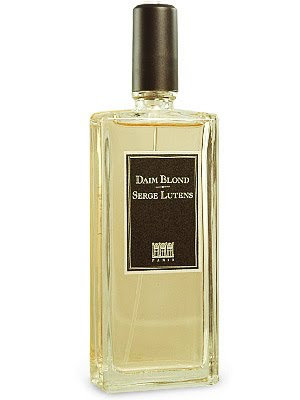 (Even the Lutens scents I despise, such as Louve, make me think: I can't deny that. They just don't make me think good thoughts.) 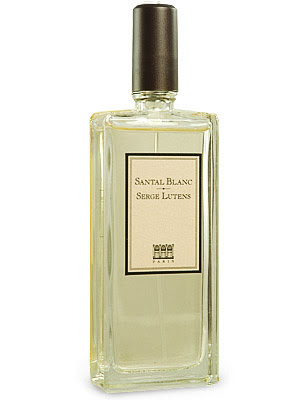 Santal Blanc is not the most accessible fragrance in the world, because not everybody wants to smell like a pencil or a polished wooden coffret, but I would have to call it one of the most accessible of the Lutenses, because almost from the outset it lays all its cards out for you to read; a bit of yumminess, a bit of sweetness, a bit of bitterness and of spice, and at the centre of it, gorgeous wood. How could you not love that? * I read descriptions of Pour L'Homme a while ago that had me doubting my own memory, because they were literally nothing like what I knew the scent to smell like; it finally dawned on me that these people had to be talking about a reformulation. Even the bottle's been changed; why wouldn't the contents, particularly now that proper sandalwood is so hard to come by? I try to avoid telling this to people who are about to tell me about a dream they had last night, but other people's dreams are staggeringly boring. I mean, I'll listen, and I'll make the appropriate comments and noises, but really, what could be more uninteresting than hearing what happened to someone when they weren't even awake? It's like listening to a six-year-old recount the plot of a movie that you didn't see, and what's more, wouldn't ever see. Having said that, I am about to recount a nightmare I had last night, but I promise I'll keep it short. You are welcome to not read any further, of course. 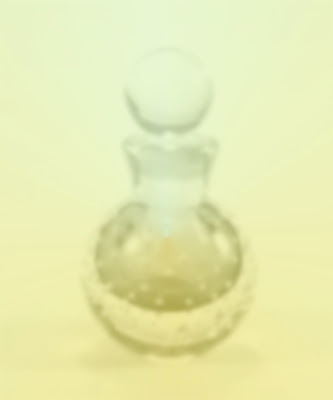 I dreamed that all my scents, all of them, from the smallest samples to the largest full bottles, had gone off to varying degrees: they were all in corrupted shades of brownish gold, possibly my least favourite colour, and they were all worthless, from slightly wrong (but still unwearable) to completely disgusting. Another year begins, and when I look back on 2009, all I can think is, There were about a thousand new scents released last year, and I managed to smell about twelve of them. I haven't tried a single one of them. Not one. I went to New York twice in one year and visited a bunch of fragrance stores, I order as many samples and decants as I can afford to from The Perfumed Court and The Perfume Shoppe and Luckyscent, and I just can't keep up. And most of the stuff that's released is mass-market stuff, cloney fruity florals for the ladies and aquatic fougeres for the men, fragrances I don't have any interest in (but I'll sniff them anyway when they show up at the local hyperdrugmart or department store), and I can't even keep up with that, let alone the good stuff. It's enough to make a boy give up. But that's not happening. Comme des Garçons, not satisfied with churning out large quantities of mostly fascinating themed scents, has begun working with other companies, design firms and clothing designers and milliners and the like, to churn out even more scents. One of those is Artek, a Finnish design company and the namesake for the latest collaboration, Artek Standard (or, according to the typography on the bottle, STANDARD). If you would think that a scent named after a design firm might smell kind of industrial, well, you would be right on the nose. It suggests a factory in which wooden window frames are made: there's a lot of freshly circular-sawed cedar, the shiny-bright smell of glass cleaner, a hint of putty, a brilliant twang of polished metal. There are supposedly flowers, spices, and tea in there, too, but really it smells of the construction of things. 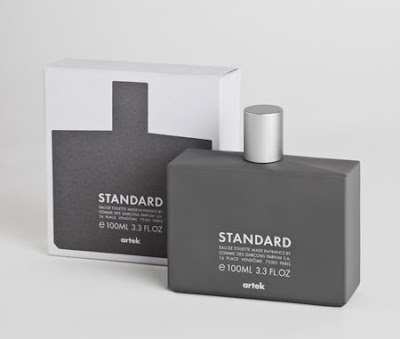 Despite all the sawdusty cedar, it has a supremely clean and slightly harsh smell that calls to mind another Comme des Garçons scent, Dry Clean, but where that was chemical and deliberately synthetic (and, to my nose, vaguely horrifying), Artek Standard seems composed of natural, or natural-ish, smells. The sandblasted sterility of Dry Clean has been replaced by the sort of cleanliness that might occur in the real world, in your everyday life (if you worked in a window-making factory, that is). I am surprised to find that I like it a lot. The smart, pared-down bottle, too.